Natures Privacy Screen - All Year. All Green. 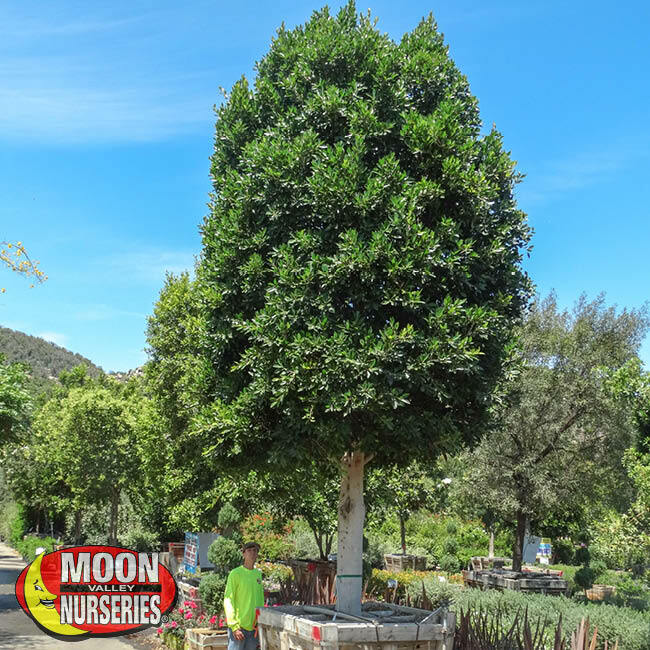 If you are looking for a tree to add to your landscape that will stay green all year round, you want a Moon Valley Absolute Evergreen tree! Evergreen trees keep their green leaves throughout the year, providing much needed color to our landscapes. Whether your goals for your evergreens are for cooling your home in the summer, privacy from neighbors, or blocking unwanted views, Moon Valley Nurseries has you covered! Evergreen trees are a highlight to any yard with their year-round green foliage and low maintenance needs. These trees can stand up to heat waves and handle any water restrictions. Plus, these evergreens are sure to be a beautiful addition to your yard. There are many reasons why our Indian Laurel trees and columns are best sellers at Moon Valley Nurseries. They create instant shade, privacy, and curb appeal quickly (even faster if you get a specimen size!). The Indian Laurels are an amazing evergreen option that performs well in any landscape and will keep its dark, dense and lush foliage all year long. They handle the Arizona sun very well and are drought-tolerant, once established. They grow fast so it won’t take long to see their amazing traits in action. Once the Indian Laurel is at your desired size, you can prune it to almost any shape or size that is best for your landscape needs. We offer three different variations of Indian Laurel: Single-trunk, Multi-trunk, and Column. All three forms are great choices to act as barriers for blocking sun, noise, and wind. The foliage is so dense, it could probably even stop a golf ball from going into your yard! 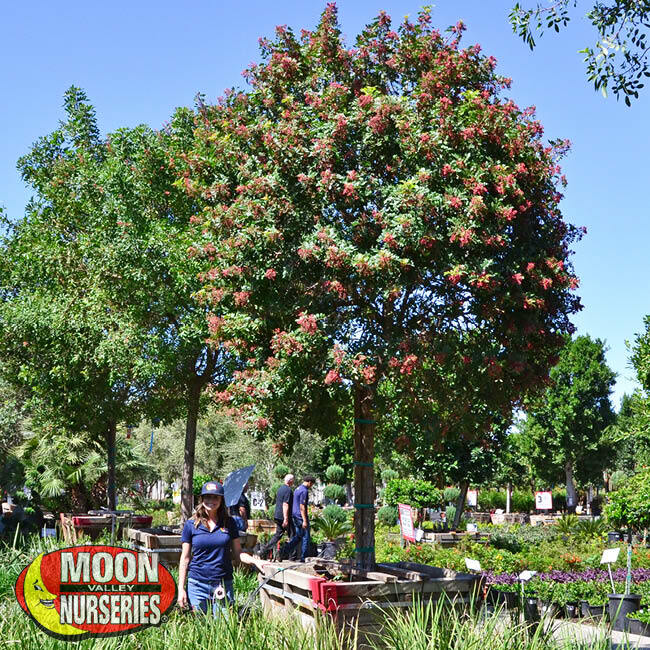 The Brazilian Pepper tree is a gorgeous evergreen that is known for its merged leaves and shiny red peppercorns. This tree provides year-round shade and privacy with its thick and dark foliage and spreading canopy of crisscrossing branches that support its finely toothed and dark green oblong-shaped leaves. The Brazilian Pepper tree blooms eye-catching small red peppercorns throughout the fall, often mistaken for red berries. Its dark-green foliage and red color make it an extremely popular tree to plant in any landscape seeking instant color. This tree is a great choice for planting in the Phoenix region because it loves the heat! Not only is it a great tree with an amazing pop of color, but it also attracts birds and butterflies to your yard for some fun entertainment. Our certified fruitless strains and disease-free olives have grown their entire lives in the hot and dry inland climate at one of our own Moon Valley tree farms. Our growing process not only makes them a far more superior tree but one of a kind. They can grow to be medium-sized trees so that they are the perfect fit for any landscape! These evergreens can grow with a wide-spreading canopy, which makes them the ideal option to choose as a shade tree in your yard or even just as a silhouette against homes and fences. Fruitless Olive trees need full sun and can tolerate a variety of soils, including poor, stony, shallow soils, which makes almost any planting location possible! So, we like to plant them in a place where they are sure to add plenty of evergreen interest. They also have an impressive multi-trunk structure that makes them an excellent choice for display by landscape lighting, where they add drama, curb appeal, and super cool shadows to any yard! Ever get stressed out when you’re trying to think of the perfect gift for somebody that is going to be meaningful and long-lasting? There is nothing better than giving the gift of a new tree to somebody or gifting one to yourself! By gifting a tree, you are giving a one-of-a-kind gift to the persons in your life, truly making it a unique and personal choice. You can also feel good about gifting a tree for the positive effects it has on the world around it. Just one tree can make the air around it cleaner, therefore helping anybody that lives nearby. 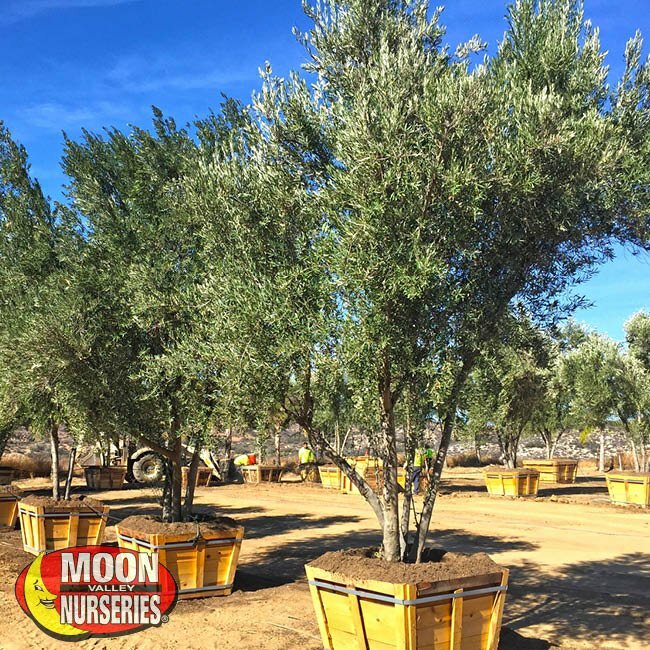 Come by your nearest Moon Valley Nurseries location and check out our amazing selection of trees in all sizes and don’t forget about our #FreePlanting!